The Vision Zero Task Force convenes their first meeting since Portland City Council adopted the Vision Zero Action Plan in December 2016. (Feb. 16, 2017) – PBOT and partners are pursuing a variety of actions related to the recently adopted Vision Zero Action Plan. Today, the Portland Timbers announced a partnership with the City of Portland and the Portland Bureau of Transportation to support Vision Zero through education, public service campaigns and direct communication with area students. Over the next several weeks, PBOT will activate four additional speed safety cameras on SE Division Street and 122nd Avenue, and will continue supporting several proposed state laws that would improve traffic safety. PBOT has also identified funds to launch a DUII prevention program in downtown Portland that will include a private-for-hire voucher system and additional driver safety education opportunities. 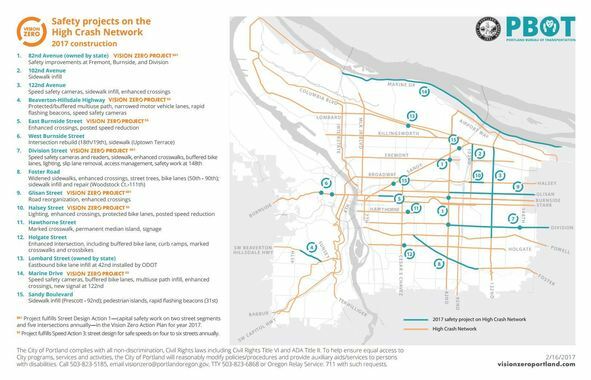 Click to view an enlarged version of this list and map of safety projects going to construction in 2017 on the Vision Zero High Crash Network. "My highest priority is the swift and effective implementation of our Vision Zero actions,” says PBOT Director Leah Treat, who chairs the Vision Zero Task Force, charged with overseeing Portland’s Vision Zero work. 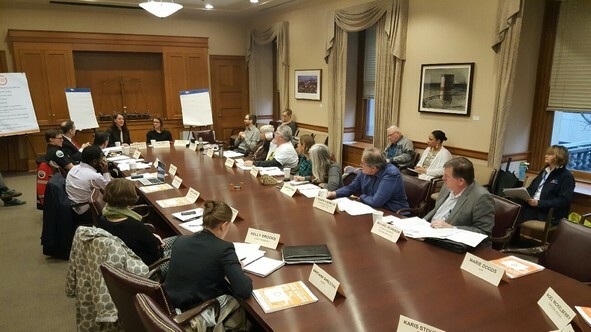 Today, members of the Vision Zero Task Force convened their first meeting since Portland City Council adopted the Vision Zero Action Plan in December. Members discussed PBOT’s legislative priorities, general fund budget request, and 2017 capital safety projects. New Task Force members include Karis Stoudamire-Phillips, who leads corporate social responsibility for Moda Health, and Brook McCall, a public health professional and advocacy coordinator for the Oregon Spinal Cord Injury Connection. PBOT is putting special focus on outer SE Division Street as part of its near-term multimodal safety strategy. The bureau is pursuing an emergency speed ordinance that could immediately drop the posted speed from 35 to 30 miles per hour. Under leadership from APANO and the Division Midway Alliance, Director Treat and Commissioner Saltzman are joining a community listening session on Feb. 23 to inform future outreach and capital projects in the area. In addition to Division Street, PBOT will start or complete capital safety projects on 12 High Crash Network streets in 2017. Projects include changes to outer NE Glisan Street, where PBOT is analyzing reorganizing the travel lanes and will install enhanced crossings.